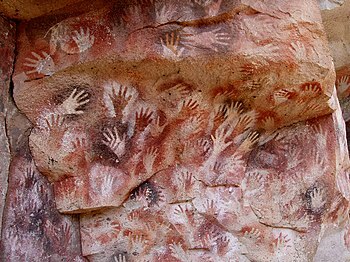 ↑ Ghosh, Pallab। "Cave paintings change ideas about the origin of art"। BBC News। BBC News। "The minimum age for (the outline of the hand) is 39,900 years old, which makes it the oldest hand stencil in the world," said Dr Aubert. "Next to it is , and this is one of the oldest figurative depictions in the world, if not the oldest one," he told BBC News. There are also paintings in the caves that are around 27,000 years old, which means that the inhabitants were painting for at least 13,000 years." ↑ Jaroff, Leon (১৯৯৭-০৬-০২)। "Etched in Stone"। Time। সংগ্রহের তারিখ ২০০৮-১০-০৭। Wildlife and humans tend to get equal billing in African rock art. (In the caves of western Europe, by contrast, pictures of animals cover the walls and human figures are rare.) In southern Africa, home to the San, or Bushmen, many of the rock scenes depicting people interpret the rituals and hallucinations of the shamans who still dominate the San culture today. Among the most evocative images are those believed to represent shamans deep in trance: a reclining, antelope-headed man surrounded by imaginary beasts, for example, or an insect-like humanoid covered with wild decorations.